When people think of centrifuge tubes, their first thoughts go to the 15mL and 50ml centrifuge tubes. Generally manufactured with polypropylene and designed to be optically clear, these tubes come in several different types of packaging. 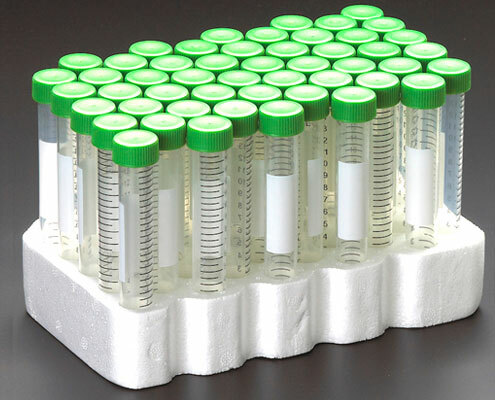 Either arriving sterile or non-sterile, the centrifuge tubes can be packaged in bulk or racked. The ability to personalize the standard tubes in this manor is what makes them so versatile. 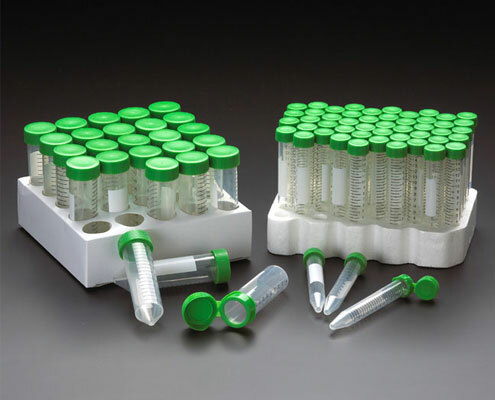 The 15 and 50mL tubes can be used to store samples, fractionations, pelleting, and of course centrifugation. While all 15 and 50mL centrifuge tubes have similar features. There are a few specific attributes you should consider before purchasing, including their maximum centrifugations force and temperature ranges. For example the 15mL centrifuge tubes and the 50 mL centrifuge tubes from CELLTREAT can both withstand temperature ranges between -80°C to 120°C. But the 15mL tube has a max force of 12000 g, while the 50 mL tube have a max force of 16000 g.
Large volume centrifuge have the same general profile of the 15 and 50mL centrifuge tubes, but differ in volume size and wall thickness. The thicker walls of these tubes allows for the larger sample amounts to be centrifuged without Large Volume centrifuge tubes are typically manufactured to hold 225mL or 250mL. In order to prevent the large volume centrifuge tubes from leaking, there caps are equipped with integral plug seal. These tubes generally come sterile and are great growth of plasmids or yeast. Large volume centrifuge tubes can also be used for the analysis of soil or water samples. When shopping for large volume centrifuge tubes it is important to see if the tubes come with a rotor cushion. In most cases, such as with the CellTreat Large Volume Centrifuge Tube, they are sold separately. Relatively newer to the market, the black centrifuge tube is manufactured to be completely opaque. This feature means researcher no longer has to deal with the hassle of aluminum foil when trying to protect light sensitive samples. The black centrifuge tubes from CellTreat are manufactured from medical grade virgin autoclavable polypropylene and come in the standard 15 & 50 mL sizes. This feature is also available in their microcentrifuge tubes. To keep labeling simple these tubes come with large white area. 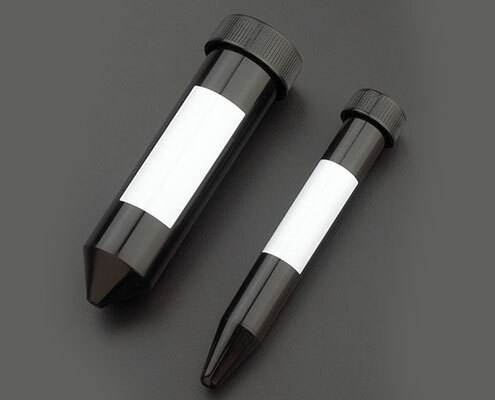 The black centrifuge tubes are perfect for applications involving light sensitive samples, such as staining samples for analysis. Searching for the centrifuge tube perfect for your labs needs can be grueling. Let the experts at Piptette.com help you. With our large selection of high quality centrifuge tubes we are sure to find a tube to suite your specific needs. 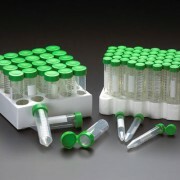 Ever expanding our selection, Pipette.com has added the CELLTREAT line to our inventory. Check out their high quality and versatile centrifuge tubes and other products here. To find out more about our tubes or any of our great products, contact at us by email or phone.